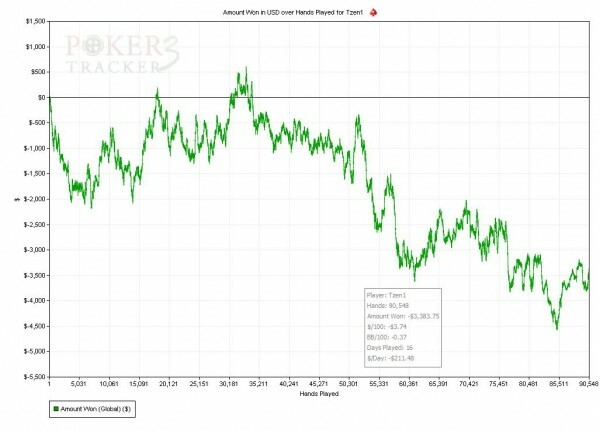 It’s already the end of March which has been a great month but not considering poker 😉 It was great because of the beautiful weather we’ve had for at least 2,5 weeks now and that’s something that doesn’t happen very much in March over here. I’ve blogged about my ups and downs this month, about my lack of motivation and the need for goals. This blog will be about that and my final results for the month which were not that bad until last week. I must say that my mindset has changed as I also predicted/hoped in my last blog. I’ve found goals for both poker and cycling and I could already notice the difference in both poker and “real life”. The goal I basically found for poker is a monetary one, maybe not the best sort of goal but at least it gives me plenty of reasons to try and do the best I can . Since I was young I’ve always been busy in various ways to earn money, my first job was spreading newspapers I then moved to buying and selling Magic the Gathering cards and already started to work for my current employer (I still work part-time for those who don’t know) since I was 16. When I was a kid I did all kinds of stuff when it was busy season in my hometown to try and make some money from all the tourists that visited the beach over here and I started trading stocks when I was 13/14. All in all I loved to have money in my pockets. Yeah earning money was probably the main reason for doing most stuff but I never did stuff I didn’t like to do. I always liked playing cardgames as well and from my 15th till 17th we played a homegame every Friday. Poker was back then already sort of my 2nd incoming, but way different from what it is now. So I was always busy making money in a fun way and when I got older my dreams got bigger. In stead of having plenty of money to buy myself a new computer or scooter my dream was to by a house, create the opportunity to do whatever I want, whenever I want and now I’m 28 I could say I achieved most of this. I achieved this at trough my normal job since I started really young but when I started with playing poker serious in 2008 my saving account has only become bigger. I’m not filthy rich, I don’t even have a car for example but I have plenty of money to buy whatever I want or to go on holiday wherever I want. It’s luxury, it’s something I’m very proud of as well and something I sometimes like to show off just a little to much. I love the fact that I’m a self made man, I do however have to praise one of me best friends which have always been a motivator to me. My current problem is that I don’t have enough money to invest it and to live comfortable for the rest of my life but I do have enough money to not worry about the next 5 years or so. The thing that has been bothering me the most lately is the fact that earning an extra $100 doesn’t really make a difference, so why putting in the extra effort to get it? There are of course different motivators in poker like being the best, beating your opponents and getting respect from your peers. I’ve explained in previous blogs before that I don’t think my skill lies in poker itself, it lies in discipline. I’m not cut out of the right wood to be the best in what I do, but I make most up in discipline and will work hard in anything I do to make it to the top 10 or 5%. I will still continue to improve my game, still expect to gain a net result this year at the tables but I do think having a goal to earn that extra $100 again is important. It will both help me to motivate myself to improve my game, but also to keep grinding when I feel less motivated to do so. When I was young the idea has always been to earn money with money. The better you invest your money the more you can make out of it and you need money to make even more money. Owning houses is one way to do it and since I bought my current house 5 years ago I’ve always had a plan in the back of my mind. I’ve bought probably something typically dutch and I don’t even think there is an English translation for it so I will try to explain it. I live in a pretty typical dutch house but don’t own the whole building. On the ground floor there lives an older woman who owns the ground floor and the back and frond yard. I live at the 1st & 2nd floor so got more square meters but in stead of a yard I got a small balcony. You won’t really call it an apartment, as from the outside it could just be 1 house. It’s was originally build this way somewhere in the 1930’s, sure there are people who had one big house and divided it in two which is basically not very different but it’s still a slight difference. Since I bought my house I always had the idea to buy the ground floor as soon as it gets out on the market but for that I need a lot of money. The most important thing is that I would gain full control of anything I would like to do with the whole building and I have plans to make some improvements that would make my living part better and more valuable as well. My idea is then to rent out the ground floor and to make some money out of it, which w0uld be the start of getting income from different methods then labor. It’s always been an idea but as said I would need a lot of money. I mortgage is not really an option as I already have one on my current house and getting one based on a poker income isn’t really an option unfortunately. I estimate I need about €250.000 in hard cash, to both buy the house and renovate it. I’m of course dependent on when the current owner wants to sell it but since she is pretty old 75+ it could be any moment, but who knows. I would be really bummed if I would miss out on this opportunity so my goal is that get that money together as soon as possible. I rather work hard for the money and have it then regret the fact that I was to spoiled to keep working hard to earn money since I had “plenty” already. Plenty is actually a strange word as some people might think that owning less then €250.000 isn’t really plenty, others consider owning more then €10.000 rich. It’s something that really motivates me now and basically it was already in my mind for years. The goal isn’t that easy but it should be a reason to keep doing what I do best, grinding! The goal actually isn’t really a monetary one by itself, the goals is to live my dream and trying to achieve a dream is what lives is often about! I really loved the 60th Billion Milestone Promotion as it also kept me playing longer then normal. Hitting one myself wasn’t bad either of course and on Tuesday when the 60th Billion hand hit I was playing as well. The hand was dealt on a $5/$10 6-max LHE table and when I clicked to see what table the milestone had hit I saw some familiar avatars and went looking for mine, about 2 seconds I thought, maybe it’s FR LHE, I was playing at that moment with some of those avatars as well but I soon figured out it was 6-max 🙁 It’s a bit the same as missing the jackpot in a lottery by 1 number, you are basically as far away from the big prize as any other but you have that rush for a moment. Pogo650 was the happy winner of $102.090! One guy even folded preflop as you could see! Now that is something that has happened with many milestone hands before and I think it says a lot about the current state of poker. People might be a lot better then years ago but as long as you make sure you know all the angle’s in the game there will always be players like that who make sure you will remain to have an edge. I also shipped our 10th weekly HomeGame after finished 2nd last week. Nothing major of course but winning a tournament always feels good. The first 8 HomeGame tournaments I didn’t even finish in the money but now I’m even up, so not complaining here 😉 I also played the Turbo Takedown and managed to finish ITM and go out with a beat and the same counts for the monthly freeroll on Saturday in which I called a guy who open-shoved for his whole top20 stack on the cutoff and I called with pocket 8’s as I saw him doing that two rounds before as well with a really bad hand. This time he had T5s but managed to flop and turn a T so I could wave goodbye to a top10 stack. The difference however with last time when I was playing tournaments is that this weekend I felt really good about my tournament play. I played well in all of the tournaments, got beats but picked it up really good and moved on. Q1 is now over and I’ve reached my VPP Goal of the first quarter. I started the year with my trip to the Bahamas and since then I’ve grinded out 163K VPPs. Nice on schedule for a 700K VPPs finish. I am however again down $1.260 for the year something which I’m really not happy with. In February it looked like I was doing fine but I’m now heading the wrong way. $1.260 could be easily won in one session so it’s all pretty minimal but with renewed energy and goals I will work hard in April to get myself in the green again. I did not miss you in the Home game table this week(was first). Now you have played the tournemants well, do you enjoy it more ? Or you like limit more ?